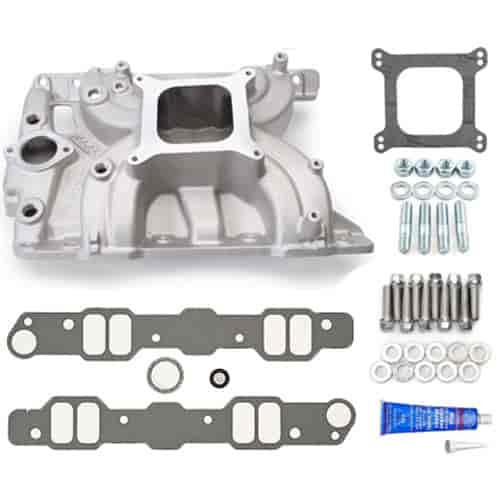 Designed for street 1965-79 Pontiac 326-455ci V8's. Can be used with Ram Air IV heads; will not fit Ram Air V heads. Will not fit 265/301 c.i.d. V8s or under Trans Am Shaker Hood. Port Exit Dimensions: 1.03" x 2.03"
For 1968-71 use #350-8015 throttle bracket. The Edelbrock Torker-II manifold is a single-plane, low-rise design that works well for high-rpm, high-performance street applications. The low profile of a Torker-II intake is ideal for applications where hood clearance is limited. A Torker-II produces gains in top-end horsepower with adequate throttle response. These manifolds are not mileage or emissions related manifolds, they are only for high-performance applications.